Description: Modern science has discovered facts about the atmosphere mentioned in the Quran over 1400 years ago. In the first verse God swears by the skyand its function of ‘returning’ without specifying what it ‘returns.’ In Islamic doctrine, a divine oath signifies the magnitude of importance of a special relation to the Creator, and manifests His majesty and the supreme Truth in a special way. The second verse describes the Divine Act that made the sky a ‘ceiling’ for the dwellers of earth. Let us see what modern atmospheric science has to say about the role and function of the sky. 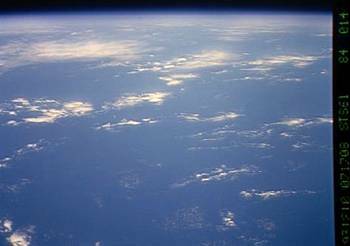 The atmosphere is a word which denotes all the air surrounding the earth, from the ground all the way up to the edge from which space starts. The atmosphere is composed of several layers, each defined because of the various phenomena which occur within the layer. This image shows the average temperature profile through the Earth’s atmosphere. 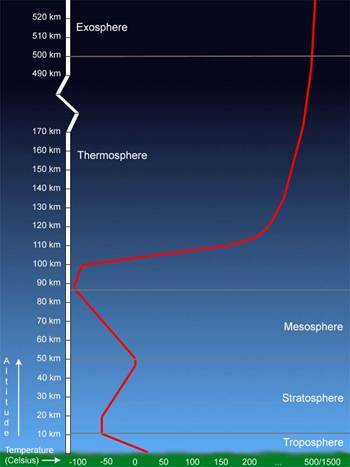 Temperatures in the thermosphere are very sensitive to solar activity and can vary from 500°C to 1500°C. Source: Windows to the Universe, (http://www.windows.ucar.edu), the University Corporation for Atmospheric Research (UCAR). ©1995-1999, 2000 The Regents of the University of Michigan; ©2000-04 University Corporation for Atmospheric Research. Not only does the atmosphere return what was on the surface back to the surface, but it reflects back into space that which might damage the flora and fauna the earth sustains, such as excessive radiant heat. In the 1990’s, collaborations between NASA, the European Space Agency (ESA), and the Institute of Space and Astronautical Science (ISAS) of Japan resulted in the International Solar-Terrestrial Physics (ISTP) Science Initiative. Polar, Wind and Geotail are a part of this initiative, combining resources and scientific communities to obtain coordinated, simultaneous investigations of the Sun-Earth space environment over an extended period of time. They have an excellent explanation of how the atmosphere returns solar heat to space. 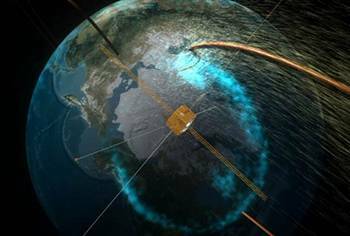 Besides ‘returning’ rain, heat and radio waves, the atmosphere protects us like a ceiling above our heads by filtering out deadly cosmic rays, powerful ultraviolet (UV) radiation from the Sun, and even meteorites on collision course with Earth. 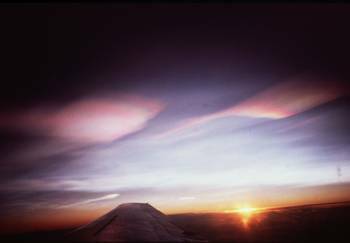 This is an image of Earth’s polar stratospheric clouds. These clouds are involved in the creation of Earth’s ozone hole. Source: Windows to the Universe, (http://www.windows.ucar.edu/) at the University Corporation for Atmospheric Research (UCAR). ©1995-1999, 2000 The Regents of the University of Michigan; ©2000-04 University Corporation for Atmospheric Research. This is an image which shows the Earth and its atmosphere. The mesosphere would be the dark blue edge located on the far top of the image underneath the back. An artist’s rendition of NASA’s IMAGE satellite flying through a ‘crack’ in Earth’s magnetic field. How would it be possible for a fourteenth century desert dweller to describe the sky in a manner so precise that only recent scientific discoveries have confirmed it? The only way is if he received revelation from the Creator of the sky. Al-Samaa’, the Arabic word translated here as ‘sky’ includes earth’s atmosphere as indicated by the verse 2:164. ”Biosphere.” Encyclopedia Britannica from Encyclopedia Britannica Premium Service. “Earth.” Encyclopedia Britannica from Encyclopedia Britannica Premium Service.